With the crypto world growing rapidly in size, many efforts are being made to optimize various processes like cryptocurrency mining but also to find real-world opportunities for the use of cryptocurrencies and Blockchain as a whole. This blog will discuss the effectiveness of mining techniques while focusing on the effect these have on the environment, as well as the future potential of Blockchain in environmental sustainability. Although there are different methods of mining for cryptocurrencies, the most common is PoW or Proof of Work, which is the mining method used by crypto giants, Bitcoin. This method has long been viewed as an expensive and time-consuming task and has a reputation for hogging energy. PoW is a requirement to define a computer calculation that is performed in order to identify a new block. The data contained in each block is verified using algorithms that attach a unique hash to each block based on the information stored on it and miners continuously verify the hashes of transactions through the mining process in order to update the current status of the blockchain assets. PoW essentially rewards miners for performing these computer calculations with Crypto tokens. Due to the computing power required to perform these calculations en-masse, the size of some of these mining warehouses and the amount of energy required to run these computers, a huge supply of electricity is required. Much of the electricity used in mining operations, like the cryptocurrency farms in China, comes from inefficient coal-based power plants that were constructed in rural areas of the country in advance of large construction projects, many of which never materialized. The use of these damaging and inefficient sources of electricity for crypto mining have detrimental consequences for the environment. According to an article published in the Nature Climate Change journal, ‘cryptocurrency mining could on its own be responsible for a 2-degree rise in temperature over the next 15 years”. This 2-degree increase in temperature also happens to be just above the 1.5-degree increase warning level that has already been determined cause a catastrophic impact on the planet in a recent climate change report produced by the United Nations. This time consuming and environmentally damaging method of mining crypto has kickstarted research into other more efficient ways of identifying blocks such as PoS. Proof of Stake (PoS) is another method of mining that was first used by Peercoin in 2012. Instead of rewarding miners, the creator of a new block is chosen in a deterministic way depending on wealth or stake. The concept states that a person can mine or validate block transactions according to how many coins or shares he or she holds. The more crypto owned, the more mining power he or she has. This way, instead of utilizing huge amounts of energy to answer PoW puzzles, a PoS miner is limited to mining a percentage of transactions that is reflective of his or her ownership stake. Despite the heavy use of electricity in certain cryptocurrency mining methods, Blockchain has also brought many opportunities across a number of industries. The blockchain is a decentralized electronic ledger system that records any transaction of value whether it be money, goods, property, work or votes. It also acts as a continuously expanding list of records stored securely across a peer-to-peer network, facilitating payments, managing records, tracking physical objects, and transferring value via smart contracts. Everyone with access to the blockchain can simultaneously view information without fail, creating trust in the system. The World Economic Forum (WEF) has identified many ways blockchain tech can be used to address some of the most urgent environmental challenges facing the planet. Blockchain tech could positively impact climate change, biodiversity and conservation, oceans, water security, clean air, weather, and disaster resilience. Blockchain has the potential to help bring about a transition to cleaner and more resource-friendly solutions, as well as to unlock natural capital and empower communities. An opportunity is emerging to harness blockchain to address six of today's most pressing environmental challenges that demand transformative action: Climate change, natural disasters, biodiversity loss, ocean health deterioration, air pollution, and water security. 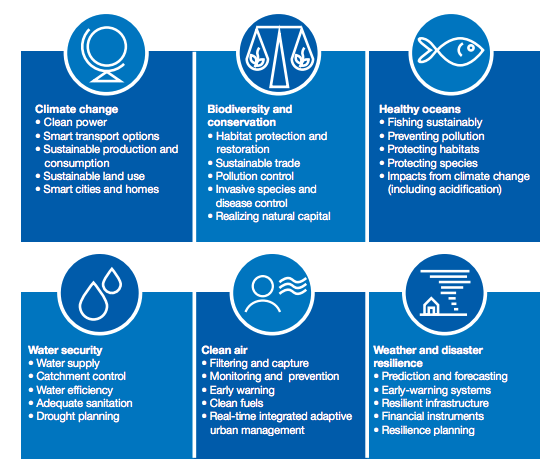 The research conducted by the WEF identified more than 65 existing and emerging blockchain use cases for the environment. Blockchain could create unavoidably transparent supply chains with products being traced from source to store. This will enable more sustainable production and logistics giving the consumer more choice to decide the origin of his purchases and chose products with low carbon footprints. Blockchain can also be very useful in raising money for environmental causes as it has the power to revolutionize access to capital and unlock potential new investors in projects that address environmental challenges. Blockchain could help raise the trillions of dollars needed to finance a shift to low-carbon and environmentally sustainable economies. Blockchain could change the way in which natural resources are consumed and traded, and also how products are manufactured, sold and used. Individuals, companies, and governments can be economically incentivized to unlock financial value in areas where things are currently being overproduced, under-utilized, wasted or treated as economically invaluable. Blockchain could underpin a new shared system for multiple parties involved in disaster preparedness and relief to improve the efficiency, effectiveness, and coordination of the delivery of disaster relief resources across many different organizations. For more information on the 65 possible environmental use cases for blockchain. With pollution levels rising and temperatures increasing, it is easy to understand why a lot of research is being done on how to conserve energy in the mining stage of cryptocurrencies. Advances such as the PoS mining method allow users to keep mining cryptocurrencies but in a less harmful and cheaper way making it more accessible for users to start than the PoW method. Further advances and research into the potential effects of Blockchain on today’s pressing environmental challenges have shown that there are some very exciting opportunities ahead. With further research and implementation, Blockchain can be used far and wide to lead efforts in environmental sustainability.